Looker is home to many Game of Thrones (GoT) nerds, and recently we got our hands on some datasets describing the TV show and books. This is Part I of III posts where we will dive into these datasets and share what we learned from the numbers on our favorite show — Game of Thrones. There are a fair few resources on George R R Martin’s A Song of Fire and Ice book series, which the show is based on (more on that later), but datasets on the TV show were much harder to find. In the end, we landed on two: a dataset on screen time from data.world and deaths in Game of Thrones by Kaggle. With some SQL magic from our analysts, we were able to join the two datasets together, as well as add some extra background from the books fact table. While there were a few limitations with this method, the data mapped surprisingly well between the book series and the TV series to create some awesome Game of Thrones data visualizations. While simple, a character’s episode count and screen time tell us a lot about how the showrunners are thinking about the characters we know and love (or hate), and their popularity. A character’s time on screen and episode inclusion is no accident. The writers of the show are putting characters in episodes for specific reasons and the amount of time they actually spend on screen is also conscious choice. These two pieces of information combined with the death data allows us to dig under the surface of the show’s storyline and look for trends and patterns in the show itself, while also examining our own perception of the show and how it differs from what the data shows. Episode 6 of Game of Thrones is the least deadly episode. When visualized, the answer to the question is pretty clear: waiting a day on episode 6 is your safest bet, followed by episodes 3 and 8… No promises though, because there has not been a consistently safe episode in the series as a whole. Overall, episode 10 consistently portrays the most character deaths. So don’t miss the finale, or if you have to, turn your eyes away from the internet until you have a chance to watch. The Game of Thrones mid season finale is deadly. A surprising tip from this chart is the spike in deaths in Episode 5. No procrastinating on the midseason episode, my friends! Seasons 1-3 were all about killing big characters in Episode 9, but starting in season 4 they started killing everyone in episode 10. None of the most popular characters has died in Episode 6 in the last three seasons. The death story arc changed halfway through the show. Which Game of Thrones character is in the most episodes? 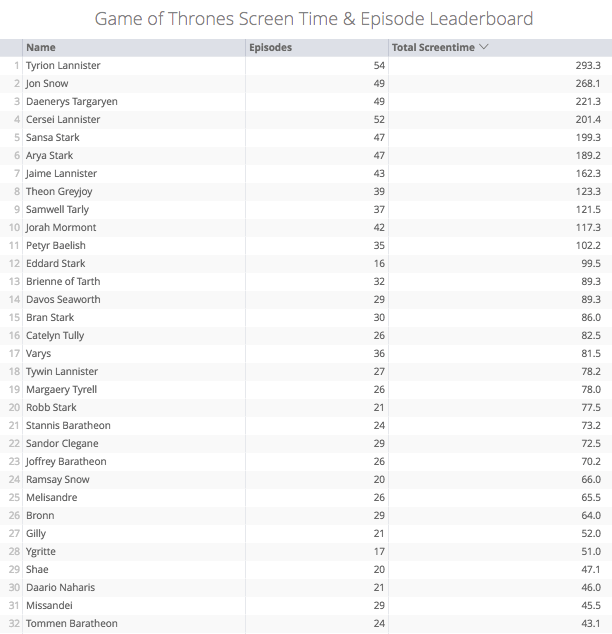 While she may not be on top in screen time, Cersei is second in overall episode count (following her youngest brother, which I’m sure she would just love). Eddison Tollett is a surprising high ranker in the episode count list. He even has more episodes than Tywin and Podrick! This was especially surprising to me, because I didn’t even know who he was when I first saw his name on the list. I have since looked him up and I’m still surprised. Missandei has been in a lot of episodes but hasn’t had very much screen time. While her role as Dany’s right hand lady explains her lack of time on screen, her inclusion in so many episodes leads to questions about her role in the show — are they leading up to something? Vary’s and Pycelle’s high ranking on this list is also telling. There are several characters with high screen time but low episodes. Now let’s move on to the fun stuff — deaths! GoT is known for killing off characters, so we examined a dataset that covers all named character deaths and when they happened. Let’s go through a few ways to look at this, starting with Death Counts by Season. Season 3 of Game of Thrones had the least deaths so far. This is interesting because it had, arguably, the goriest murder scene of main characters in the show (Hi, Red Wedding). Season 6 was the deadliest season yet... by a lot. This visualization challenges the logical assumption that overall, characters killed in later seasons would have more screen time because the show had just been around longer. Instead, it shows a cycle of characters getting very well known very quickly and then getting killed off in the same season or a few seasons later, while still maintaining the core character base. Remember those “flash in the pan” characters I mentioned earlier? Although Season 4 had less deaths, the characters that were killed had almost the same combined screen time as those in Season 6. Season 1 killed the same amount of characters as Season 2 but we lost double the screen time (entirely because of Ned Stark). Season 3 of Game of Thrones had fewer deaths than season 2. But those characters had much more screen time overall, (hi again, Red Wedding), which actually makes it more impactful deathwise. Which Game of Thrones character has the most screen time? Tyrion is definitely the star of the show. He has both the most episodes AND the most screen time. 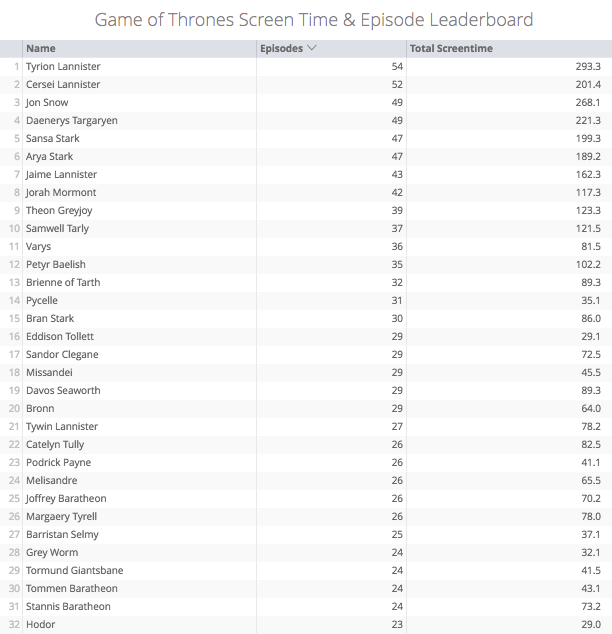 Now, this isn’t that surprising, until you look at how much of a lead Tyrion has in screen time. He has more than 25 minutes of screen time than the next character and more than 70 minutes more than the third! Jon leads Daenerys by 47 minutes but are tied in episode count. Cersei, Sansa, and Arya come next — with Cersei only leading Sansa by about a minute. I have always thought of Cersei as being a much larger character than Sansa, but according to screen time, that is not the case. I found this interesting because Cersei feels more important than Sansa throughout the show, with Sansa only really taking control over her story in Season 6. This is a clear juxtaposition of screen time vs. power in the story. Cersei has definitely done more to change the story than Sansa, but they both have had the camera pointed at them for virtually the same amount of time. What does that mean for these two characters from the perspective of the show creators? I don’t know that I have an answer, but I definitely have more questions. Sansa has more screen time than Arya. Again, I underestimated Ms. Sansa Stark until now. It’s similar to the Jon vs. Dany realization — while Arya has been leading her own story and therefore feeling more powerful and important, the show creators haven’t given it as much time as Sansa’s story. Ned Stark is ranked as #12 on the list, despite the fact that he died in Season 1. His total screen time has gotten some help from return via flashback in Season 6, but even so, he has had more screen time than most of the characters we see today. No wonder his loss in Season 1 was so jarring, he was in practically the whole thing. There are several unintuitive character pairs & groups that show up on the list. For example, Theon, Sam are very close to tied in screen time, and Brienne and Davos literally have the same amount of time on screen. Catelynn and Varys are about the same, and Tywin Lannister, Margaery and Robb are all close as well. Ramsay, Melisandre and Bronn are grouped together, and so are Gilly and Ygritte. This doesn’t provide a ton of insight, but it does show us who the show creators think are at similar levels of importance. Insights from this GoT data range from surprising to mildly interesting, and it all leads to even more questions. Take a look at Part II in our Data of Thrones series, where we look at screen times and the breakdown of on-screen data between genders and characters, and Part III for Season 7 predictions that are (loosely) based on data. Disclaimer: Game of Thrones belongs to HBO and is not affiliated with Looker in anyway.